The Universal Inclinometer makes it practical for each examiner to have their own inclinometer to measure range of motion. It replaces estimating range of motion or using a goniometer for quick and easy upper and lower extremity range of motion measurements. The Universal Inclinometer can also be used in pairs (dual inclinometry) to measure the lumbar, thoracic and cervical spine. The Universal Inclinometer is fluid damped to permit fast, accurate readings without waiting for oscillations to damp out. The Deluxe Inclinometer utilizes a ball technology that reduces the inclinometer’s sensitivity to vertical positioning. 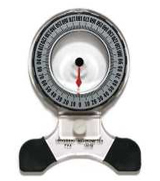 The Deluxe Inclinometer has a three inch dial that provides readings to one degree. The inclinometer is fluid damped to permit fast, accurate readings without waiting for oscillations to damp out. 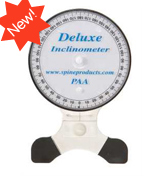 The Deluxe Inclinometer can be used to quickly and accurately measure upper and lower extremity range of motion measurements as well as lumbar, thoracic and cervical range of motion measurements. The CROM Basic (Cervical Range of Motion Instrument) has set the standard for accurate measurements of the sagittal, coronal and horizontal range of motion movements that can be performed by the cervical spine. Using a patented mainframe which is positioned to the nose bridge and the ears, the CROM eliminates location errors, initial head position errors and tracking errors. 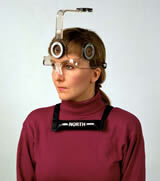 The CROM uses a patented rotation unit that allows the patient to be measured in the preferred upright position. 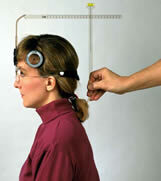 The CROM replaces the dual inclinometer method for cervical range of motion measurements. The CROM Deluxe (Cervical Range of Motion Instrument) provides the same patented mainframe and rotation unit as the CROM Basic for measuring cervical flexion, extension, rotation and lateral side bend in the preferred upright position. The CROM Deluxe features the addition of a head forward unit for measuring protrusion, retraction and dorsal glide. Since the head forward arm is easily inserted into the mainframe, it takes only a few additional minutes to obtain head translation measurements without having to reposition the patient. The CROM 3 is the next generation of inclinometer based measurement instruments. Like the original CROM, it has a patented mainframe and rotation unit for range of motion measurements, but with the addition of three-inch ball inclinometers, it is easier to read and use. The ball technology reduces the inclinometer sensitivity to vertical positioning and the three-inch inclinometers read to one degree. The CROM 3 can be used for all cervical range of motion measurements. 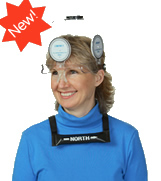 A specially adapted head forward unit for protrusion, retraction and dorsal glide can be purchased separately. The BROM (Back Range of Motion Instrument) has set the standard for accurate, repeatable measurements of the lumbar and thoracic spine. The BROM uses a patented inclinometer based instrument for measuring rotation and lateral side bend in the preferred upright position. The magnetic inclinometer and reference eliminate hip substitution errors. The BROM is the only instrument that can measure lumbar rotation accurately. The BROM Basic includes two Universal Inclinometers for measuring flexion and extension of the lumbar spine. The BROM II (Back Range of Motion Instrument) includes the same inclinometer based instrument as the BROM Basic for measuring rotation and lateral range of motion of the lumbar and thoracic spine. The BROM is the only instrument that can measure lumbar rotation accurately. The BROM II features a unique, inclinometer based flexion/extension unit that allows multiple examiners to obtain accurate and repeatable measurements. The BROM uses a standardized written protocol.